Having already overhauled its mobile application for iOS devices some months ago, Facebook has issued a new update to its Android application today that offers a new user interface similar to that found in Facebook for iPhone. One of the most noticeable changes is that your navigation menu has moved to the left-hand side of the application. You can access it by simply swiping to the right, and it provides easy access to your news feed, groups, events, friends, and more. It’s now even quicker to access your messages thanks to a dedicated button that sits right at the top of your display. Hit the button to display your messages, and quickly respond to friends without leaving the page you’re on. With the latest version of the app, photos are significantly better, and two times faster than the previous Android app, according to Facebook. It’s also easier to share snaps with your friends, view comments, and edit captions. The improvements are identical to those made to Facebook’s iOS applications earlier this year, and they certainly improve the Facebook experience on mobile devices. Unfortunately, the iOS version is still plagued with a number of bugs (as always), so let’s hope the Android version is more stable. As always, the Facebook application is available to download for free from the Android Market. 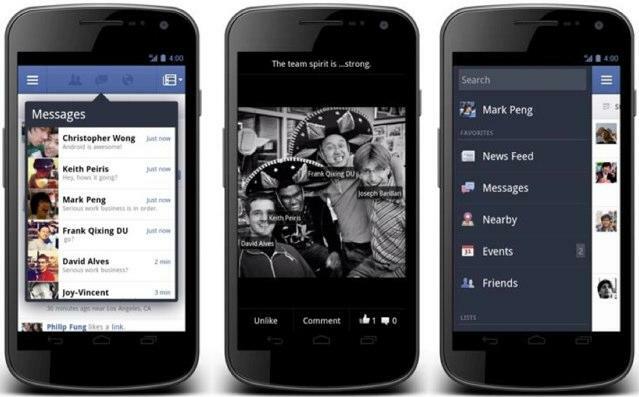 What do you think of the new Facebook app on Android?